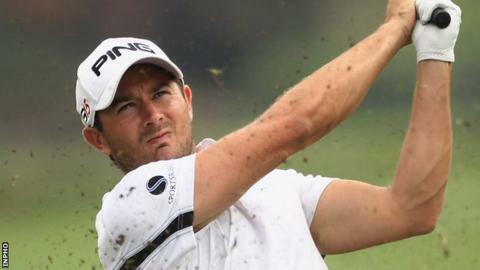 Gareth Maybin has suffered another injury setback in his latest bid to return to competitive golf. The Ballyclare golfer has been forced to pull out of this week's Johannesburg Open because of the wrist injury that has bothered him since June 2015. "Absolutely gutted to have to withdraw from @JoburgOpen_ with same wrist issue," Maybin tweeted on Thursday. Former Open champion Darren Clarke was two over after 14 holes of his first round before bad weather stopped play. America's Paul Peterson is the leader on nine under after carding a 62 on Thursday. Maybin played in a Pro-Am in South Africa last week on his return to action after 20 months out of the game. He lost his European Tour card in 2014 and had hoped to play in around 15 tournaments on the Challenge Tour the following season, before suffering a bad wrist injury in June. Meanwhile Graeme McDowell and Padraig Harrington both posted opening rounds of two-over-par 72 at the Honda Classic in Florida.